Showing 1 - 15 of 26 articles tagged "Andy Samberg"
SNL alums Andy Samberg, Akiva Schaffer and Jorma Taccone are planning to visit seven cities in June. Turns out Samberg's long hair during his first season on Saturday Night Live in 2005 was even longer. Samberg revealed the 18 jokes on Late Night with Seth Meyers, including one written by Meyers himself. “Sandra Oh is the best person on earth,” Samberg said on The Tonight Show. Is it time to give up on having awards show hosts? 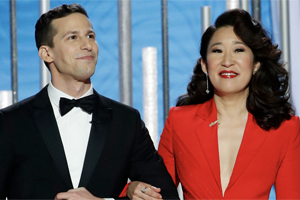 Sandra Oh and Andy Samberg were the perfect hosts for a ceremony that didn't want any trouble, says James Poniewozik. NBC has unleashed three promos for Sunday's Golden Globe Awards, including one that addresses the "elephant" in the room. 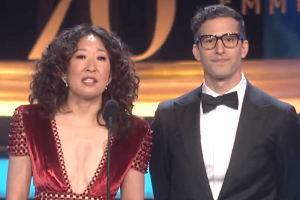 Sandra Oh on co-hosting the Golden Globes: "Oh my God, I'm terrified! I am super thrilled, so it's the good terror"
Watch the "all-action" trailer for Season 6, premiering on NBC on Jan.
Andy Samberg: "I had good training for parenthood by working at SNL"